Consumer demand for technology-driven financial tools has fueled the creation of innovative products that offer convenience, transparency and security. A great example is the proliferation of prepaid cards, which have grown in popularity among consumers of all ages and socio-economic classes as a reliable and easy way to manage funds. According to a 2014 survey, 57 percent of the U.S. population had used two or more types of prepaid cards in the prior 12 months. With growth and evolution, regulators must ensure adequate protections are in place for consumers. 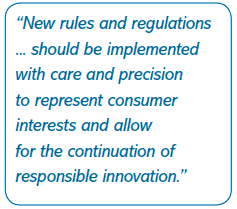 New rules and regulations, however, should be implemented with care and precision to represent consumer interests and allow for the continuation of responsible innovation. Unfortunately, the expansive proposed rule on prepaid accounts released by the CFPB applies a one-size-fits-all approach to more than 15 unique products. If enacted in its current form, the rule will limit consumer choice by making entire categories of prepaid cards unviable and stifle future innovation for new ways to pay and be paid. The Network Branded Prepaid Card Association (NBPCA) supports a common-sense approach to regulation that both protects consumers and ensures ongoing access to these popular financial products. On average, customers currently report a 70 percent satisfaction rate with prepaid cards, so reducing choice and competition through onerous rules is a step in the wrong direction. Improvements to the proposed rule can be made in many areas. For example, the CFPB found that many consumers thought its proposed long-form disclosures were confusing and that consumers likely would not rely on them to compare products. Despite that, the rule included a requirement to provide consumers with the confusing and unhelpful long-form disclosure. Additionally, the proposed rule defaults to bureaucratic redundancy and requires that customers receive multiple disclosures, all of which would be similar, but different, and likely discourage customer review. Worse, customers also would be provided with a laundry list of fees and services that could include items not relevant to the product they are purchasing, which would likely add to consumer confusion. Rather than overburdening consumers, the NBPCA suggests that the CFPB require card issuers to provide a single, short, consumer-friendly pre-acquisition fee-disclosure form. Also, the bureau should allow flexibility in fee disclosures to increase accuracy and consumer awareness by making each disclosure pertain to the actual product being acquired. Similarly, there are other areas of the proposed rule that merit revisions to fully account for the wide array of products to which the rule would apply. One important distinction that the CFPB should make is to truly differentiate between prepaid cards with overdraft and credit features and those that occasionally may incur negative balances due to card network rules governing the settlement of transactions. This distinction is especially important in what are known as “force pay” transactions. These are instances in which cards, prepaid or otherwise, are preauthorized for charges based on an estimated purchase amount (such as the expected price of a hotel stay or gas that will be pumped into a vehicle). If the card does not have sufficient funds to cover the actual purchase amount that is settled later, the card is left with a negative balance. In this situation, the CFPB’s proposed rule would reclassify the prepaid card as a credit card. The sweeping nature of the proposed rule is especially concerning given that prepaid products are already highly regulated—subject to both state and federal oversight—and provide substantial consumer protections. For example, prepaid products have the potential to be regulated by up to eight different federal agencies, including the CFPB, the OCC and the Treasury Department. Regulation E coverage already applies to payroll cards as well as to certain government benefit cards and student cards. FDIC insurance applies in many cases as well. Through zero liability policies, the card networks also provide for reimbursement for unauthorized charges by issuers. Therefore, the CFPB should carefully consider the content of the proposed rule, implement changes that truly add protections for consumers and avoid those that would only increase red tape, redundancies and compliance costs. While the NBPCA fully supports the CFPB’s goal of protecting consumers, we caution that the proposed rule could have the opposite effect. In its current form, the rule likely will eliminate entire categories of prepaid cards from the market and could drive consumers to riskier products or eliminate their access to safe financial products altogether. Instead, the CFPB should implement common-sense solutions that protect consumers while also driving innovation and the availability of safe and effective products. Brad Fauss is interim executive director and general counsel of the Network Branded Prepaid Card Association (NBPCA). He may be reached at bfauss@nbpca.org. This article appeared in The Hill on May 13, and is reprinted here with the NBPCA’s permission. After a frantic few days in Copenhagen for Money20/20 Europe, Paul Butterworth, strategic marketing director at Trustonic, used the time during his flight home to digest the discussions and presentations and come up with the key takeaways from the fintech event. With MoneyGram and Western Union betting that Facebook-loving consumers will use “sendbots,” the old guard of remittance providers may have an edge on startups. Too often, online merchants and their payment providers focus more on international orders than domestic transactions in the battle against fraud. But drilling down into ZIP codes and neighborhoods might be a wiser strategy.